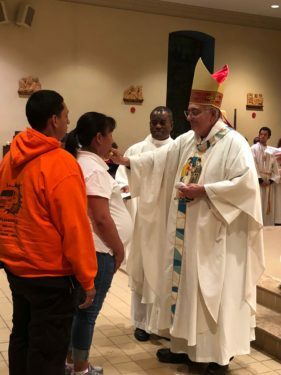 Parents of unborn children, new parents and couples trying to conceive received extra prayers from a modern bishop and an 18th-century saint at a special Mass in Hollis. Bishop Nicholas DiMarzio joined the congregation at the Shrine Church of St. Gerard Majella at its feast day vigil celebration Oct. 15. St. Gerard Majella is the patron of expectant mothers and unborn children. In his honor, expectant parents received a blessing from the bishop and were able to venerate a relic of St. Gerard. “Gerard never set foot outside of Italy, left no significant writings and died at the age of twenty-nine after only six years of religious life. But even in his day, this humble Brother was considered a saint. He was friendly and generous by nature, and his confidence in God’s goodness seemed to give him supernatural influence. One biographer called him ‘the spoiled child of God’ because whatever he asked for in prayer, he got. “After his death one particular miracle attributed to his intercession increased his popularity. A woman who had known Gerard when she was a child faced life-threatening complications during labor. “Suddenly, she cried out for a handkerchief that Gerard had given her years before. The handkerchief was fetched and placed over her womb; the women’s condition improved immediately and she delivered a baby. For the Vigil Mass, which was the culmination of a parish novena celebration, Father Josephjude Gannon, pastor, invited the confirmation and pre-confirmation class to take special part in the eucharistic celebration. On Oct. 20, the parish will host a Night of Healing and Blessing that will start with a 4:30 p.m. rosary, continue with 5 p.m. Mass and exposition of the Blessed Sacrament until 8 p.m. Priests will be available for confessions, anointing of the sick and to pray with people.